Joshimath was established by Adiguru Shankaracharya (a spiritual reformer) more than 1,250 years ago, a religious place to the Hindu. The old name of the Math was Jyotirmath, which later came too popular as Joshimath. Nanda Devi National Park is about 22 km away from Joshimoth. Many other glorious temples are also located in the place dedicated to God and Goddess. Joshimoth is paradise for the trekkers to the higher altitudes of the Garhwal Himalayas and many other wonderful destinations in this region like Valley of Flowers, Hemkund etc. 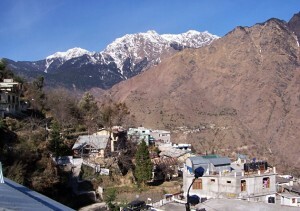 Panoramic view of Himalaya can be seen on the way of these places. Air: The nearest airport is that of Jolly Grant, 272 km from Gangotri, via Rishikesh. Rail: The nearest railway station is Rishikesh. Ghangharia: It is a large meadow, occupied by shepherds or some shopkeepers who come during the season. Walk to Ghangharia is very easy; the way ascends and descends at regular intervals, passes through a thick forest of many types of trees and several meadows. The forest is partly covered with ferns, many types of moss and huge rocks. The gurdwara and tourist rest house at Ghangharia is resting point for most pilgrims who are too tired to go much further for the day. The trek from Ghangaria to Hemkund is through forests of pine and rhododendron where wild roses, ferns, and alpine flowers bloom. This entry was posted in Joshimoth, Uttaranchal and tagged Ghangharia. Bookmark the permalink.